Since Spain is a very Catholic country, our spring break this year fell a little later than what we’re accustomed to in the United States. Here spring break is called Semana Santa, or Holy Week, and always take place the week leading up to Easter. In Spain, this week is usually filled with many procesiones where different religious brotherhoods take turns performing parades throughout the streets. We’ve heard it’s quite a sight, and some of the country’s processions are very famous, but I took advantage of the 10 day break to travel with three of my friends to some further places in Eastern Europe: Budapest, Hungary; Prague, Czech Republic; and Istanbul, Turkey. 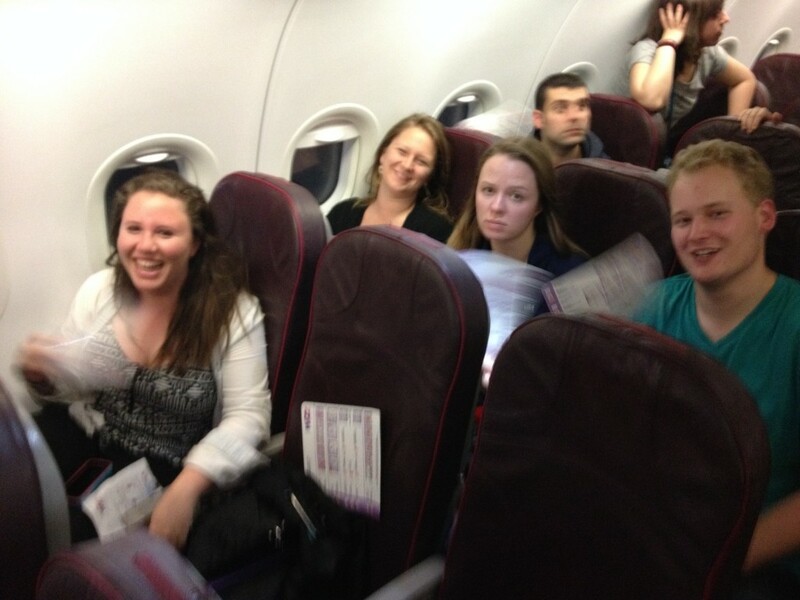 Trying to keep our spirits up while fanning ourselves on the plane! 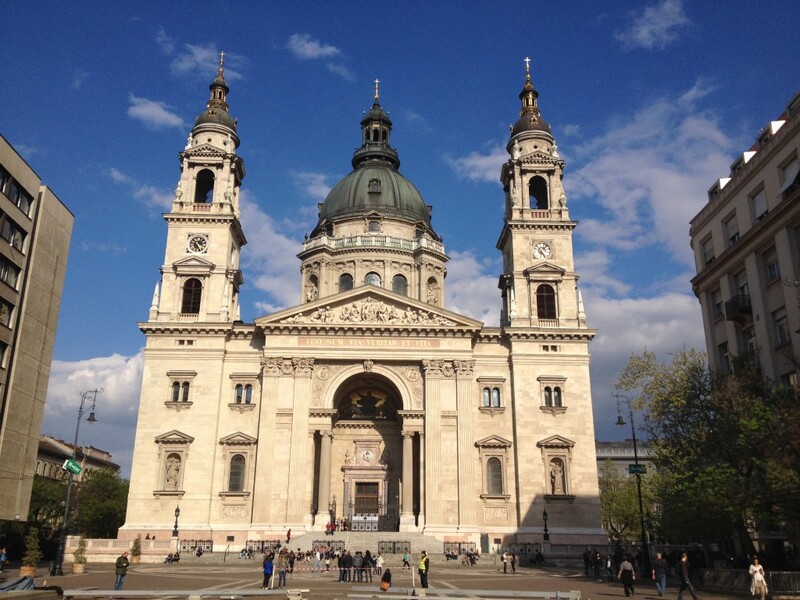 Our first stop was Budapest, the capital of Hungary. It was certainly an adventure from the very start, when our Wizz Air flight sat on the tarmac for an hour and a half before we were able to take off. There was a problem with the starter, so the pilot couldn’t get the flight going… that was scary enough, but then some people were so freaked out by it that they wanted to get off the plane, prompting a cabin-wide claiming of carry-on baggage to make sure they didn’t leave anything on the plane. To top it all off, because the plane wasn’t turning on, we had no air conditioning, so there was just a sea of people fanning themselves with the safety information card. (We figured this would be as good a time as any actually read it.) This would only be the first of many fun transportation experiences, but it certainly got our trip off to an interesting and eventful start! Despite the late arrival in Budapest because of the flight delay, we were still able to get a taxi to our home for the next three nights. It’s sad to say but our lodging was probably one of the best parts of our visit to Budapest — one of our friends found this awesome apartment on Airbnb. It was a real apartment with a kitchen, shower, bathroom, TV, and three beds, meaning I got so sleep on my own bed! (Okay, it was really the couch with a sheet and blanket on it, but still awesome.) Because we had a kitchen and a grocery store down the street, we were actually able to save money and cook dinner for ourselves one night — the pasta and chicken fingers with ketchup already inside were awesome. 😉 The location was also great, right near a Metro station with a great view of Parliament across the river. Budapest actually used to be three separate cities, Buda, Óbuda, and Pest, but the distinction between the flat Pest side and hilly Buda side still exists to this day. We were on the Buda side, which has most of the old attractions while the majority of the modern touristy things are on the other side. It didn’t turn out to be a problem though because we were so close to the metro and the river. We started off the first day with a tour of Parliament right across the river. 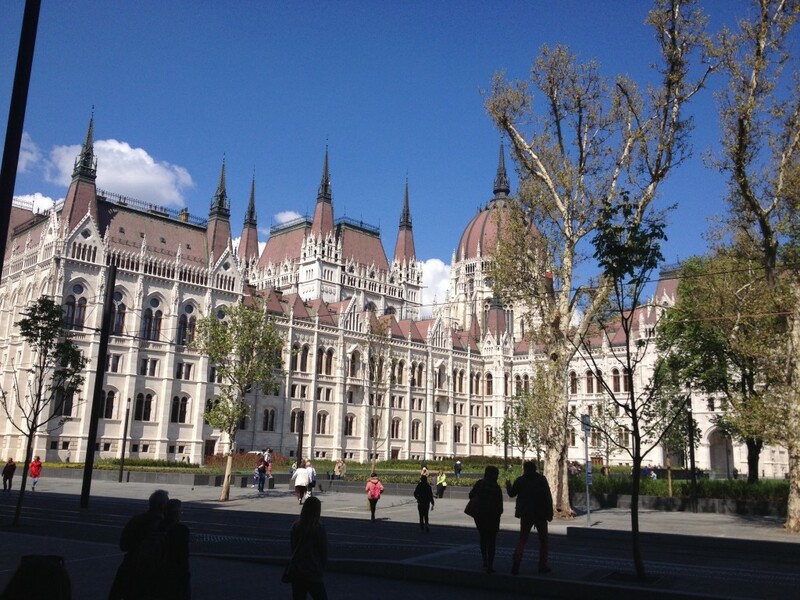 The beautiful Hungarian Parliament Building has become one of the main symbols of the city, sharing the title of tallest building in Budapest with Saint Stephen’s Basilica. They both stand at 96 meters tall, which apparently has a lot of significance in Hungarian because the Principality of Hungary was established in 896 and the country celebrated its millennium in 1896. It was very cool that we actually got to go inside the working legislative building, though it was pretty quiet when we went because the recent elections meant that they were in the middle of a recess. It turned out though that those elections were pretty significant because they had just lowered the number of members by half. After we saw the crown jewels of Hungary, we reached the end of our tour and headed off to grab something to eat. From lunch we visited the other tallest building in Budapest, St. Stephen’s Basilica. The church was very beautiful and I think we might have seen the mummified hand of the Hungary’s first king, Stephen, but the coolest part was definitely going to the top to get a panoramic view of the city. We were also told our English was very good by this nice woman who took a picture of us at the top — apparently she thought we were from Germany or Switzerland and was taken aback by how well we were speaking English. After getting some ice cream and randomly being filmed for a video, we headed back to the Danube River to see the Shoes Memorial, dedicated to the Jews killed during World War II who were shot into the river after taking their shoes off. Definitely a very sad subject, but it was a good place to see nevertheless. Later that night we went out to Szimpla, one of Budapest’s famous ruin bars. These are bars built in formerly abandoned buildings and homes in the old Jewish quarter that were given new life as cool, half-built bars. Szimpla felt like it was half inside and half outside and was definitely a very interesting experience. My EU professor had actually recommended that we check out the place, and all the guidebooks pointed to it as well! The next day we woke up early to explore our side of the river, Buda, and the major attractions on Castle Hill like the castle itself, Matthias Church, and Fisherman’s Bastion. Because I had just been to the city with my family before coming to Madrid, I had already seen most of these things, but it was good to get another visit in. The rest of the day was spent experiencing another part of the main Budapest attractions that I didn’t see last time: the old Roman and Turkish thermal baths that the “City of Spas” has become known for. We first went to the Széchenyi Thermal Bath, which is actually still used as a medicinal bath today. To get there we had to take Metro Line 1, a different line than we had been taking, which is actually the second oldest underground railway in the world. Because London’s Underground is the oldest, Budapest’s is the oldest in Continental Europe. Unfortunately I couldn’t take pictures because I kept my phone at home so it would stay dry, but you could really tell that you were riding the old line with the much smaller tunnels and older trains. After riding the metro back, we rested up for the rest of that night because in preparation for our second spa visit: a “sparty” (spa party) at the Lukács Baths. It was basically a spring break pool party, but it was a good experience to checked off the Budapest tourist list either way. Haley and I are also proud to say that we took advantage of the crazy atmosphere to chant for Atleti, one of our home teams that’s doing quite well in the Champion’s League in addition to leading La Liga. We took it easy the next day and straightened up the apartment before heading off to the train station to head to Prague. We definitely had a lot of fun in Budapest, especially with the great weather, city, and apartment. We didn’t get to do everything that I would’ve wanted, like some of the city’s famed “escape games” or walk down Budapest’s version of Paris’s Champs-Élysées, the Andrássy út, but that’s what happens when you travel with other people. It was definitely an adventure trying to deal with the challenging Hungarian language where it takes forever just to get thank you down (but where we were really excited when we figured out tér meant square), the currency whose many zeroes made prices very difficult to understand, and the strange preference for handing out a group ticket instead of four separate ones. Regardless, we hope to make it back to Budapest soon! This entry was posted in Study Abroad in Madrid and tagged 96, airbnb, andrássy út, apartment, atleti, atlético, atlético de madrid, baths, buda, budapest, budapest castle, castle, castle hill, catholic, catholicism, champion's league, church, claustrophilia, crown jewels, currency, danube, eastern europe, escape games, europe, fisherman's bastion, flight, forint, fútbol, group ticket, group tickets, holy week, hungarian, hungarian forint, hungarian language, hungary, jews, la liga, language, london underground, lukács, lukács baths, matthias church, memorial, metro, metro line 1, millenium underground railway, óbuda, pariament, pest, procesiones, religion, roman, roman bath, ruin bars, saint stephen's basilica, semana santa, shoes, shoes memorial, soccer, spa, spa party, sparty, spas, spring break, st. stephen's basilica, stephen, széchenyi, széchenyi thermal bath, szimpla, thermal bath, transportation, turkish, turkish bath, wizz air, world war II. Bookmark the permalink.